It’s exciting times to be a Spurs fan. The imminent move to the new stadium has gone fans thinking of what success this marvellous new arena could see. It will be one of the finest stadiums in the country, and with that comes the ability to bring new players to the club that want to play there. However, with the Mauricio Pochettino regime comes the ability to give the younger players a chance; and no club loves seeing their local players given an opportunity more than Spurs. Harry Kane has quickly gone from a local lad who dreamt of playing for the club, to the leading light in terms of what the young players aspire to be. His MBE which was awarded only last week was undoubtedly a proud moment for him, but a first Premier League title for the club would eclipse that. But, who could be next in line for a chance in the Spurs team? Fernando Llorente will likely be a summer departure from the club, with fans and management increasingly frustrated by his lack of goal-scoring ability. However, the suitable replacement for the tall Spaniard could already be on the books at the club. The 20-year-old made his debut for the club last season when he came on as a substitute against APOEL Nicosia during a 3-0 win in last season’s Champions League group stage. However, he is yet to play any minutes in the Premier League; despite scoring in pre-season for the team. He also found the net in the side’s post-season tour against SC Kitchee in Hong Kong. The young striker is currently out on loan at Sunderland gaining valuable first-team minutes and experience, but he is yet to score. The talent is undoubtedly there and should he be given a chance; he will surely take it. Despite being only 18-years-old Oliver Skipp has already gained approval from Pochettino, and could be a big part of the club moving forward. 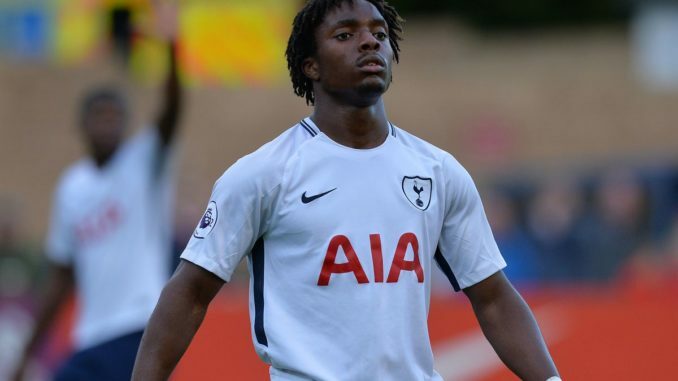 He earned the managers attention after a string of solid displays for the Tottenham academy in the U23 Premier League. He was handed a 3-year-deal at the club just days before making his competitive debut for the club against West Ham United in the EFL Cup. He impressed management that much that he was handed more competitive minutes for the club in the following game, as he came on as a second-half substitute against Southampton. The number of injuries in the midfield area meant that he was given another chance to impress when he made his first Premier League start against Burnley. Despite his age, it’s clear that there is a plan for the exciting youngster in the short-term, and he could be set to get a more significant chance since the midfield still looks incredibly weak following the departure of Mousa Dembele in January. The future certainly looks bright for Skipp. Another player that has enjoyed a lot of minutes this season is right-back Kyle Walker-Peters. With the World Cup hangover affected Kieran Trippier’s form and the inconsistency of Serge Aurier, it could be possible that the 21-year-old could put down a marker as the club’s first choice right-back. He has been around the first team since 2015 when he was part of the pre-season tour to Australia as a 17-year-old. However, it wasn’t until the 2017-18 season when he made his first-team debut. Few punters at NoviBet would have thought he would be as solid as he was; Walker-Peters managed to keep an incredibly psychical Matt Richie in his pocket for the full game. He has impressed this season as he has played in six appearances; with the most notable of which coming against Barcelona. He showed an incredible attitude to recover from an early mistake to look assured and controlled in a hostile Nou Camp. He made history on Boxing Day as he became the youngest player in Premier League history to provide three assists in a domestic fixture. Walker-Peters could be the long-term solution to inconsistent full-backs.